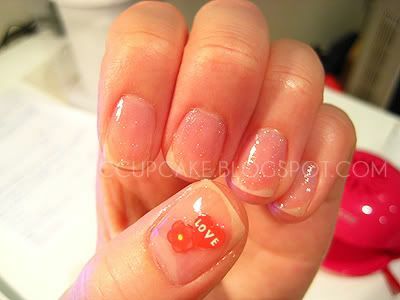 Cosmetic Cupcake: Happy Valentines Day! Happy Valentines Day! I know Valentines is tomorrow but because it happens to fall on the same day as Chinese New Year this year, the bf and I decided to celebrate a day early. We aren't really that big into Valentine's as I believe it should be EVERY day (ha!) so we usually just have a nice meal together. 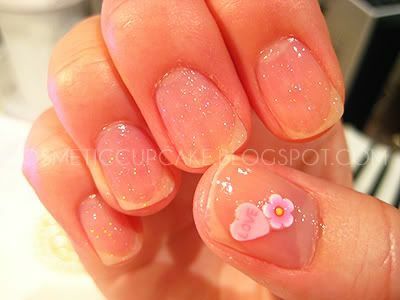 First we'll start off the with my nails of the day (NOTD). I decided to just keep it simple mainly due to the fact that my fimo decided to not cooperate with me grrrrr. I used Seche Clear base coat, 1 coat of Seche Rose, 1 coat of China Glaze Fairy dust, fimo was added and then Seche Vite used as top coat. For dinner we made reservations for Encasa which is a Spanish restaurant on Pitt St in the city. We decided to only have tapas instead of ordering mains or paella. My apologies for the photos below as they were taken with my camera phone which doesn't perform too well at night or indoors. 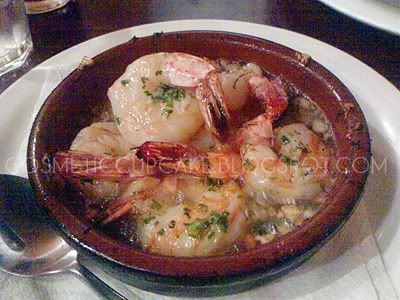 Gambas al Ajillo - Peeled king prawns in sizzling garlic oil and chilli. So garlicy and delicious the taste still lingers in my mouth! 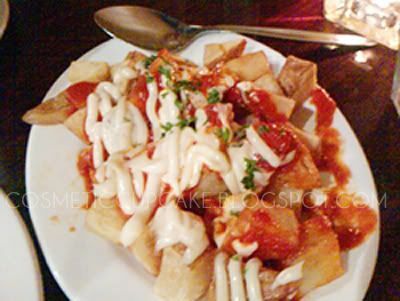 Patatas Bravas - Fried potato w/ garlic mayonnaise and spicy tomato salsa. One of my favourites! I love taters and this is no exception. The crispy taters with garlic mayo are just too yummy. Pulpo a la Plancha - Grilled fresh baby octopus. 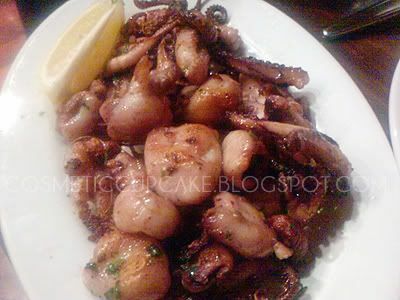 This would have to be one of the BEST grilled baby octopus I have tasted in a long time. Absolutely delicious! 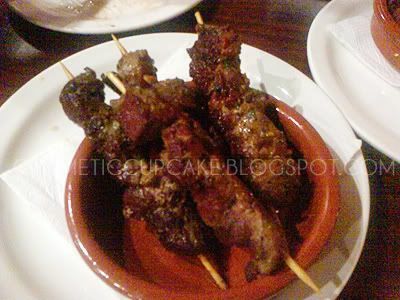 Pinchos Morunos - Prime lamb fillet skewers marinated in Moroccan spices. Lamb is my favourite meat and this didn't disappoint. The meat was juicy and tender and hit the spot. 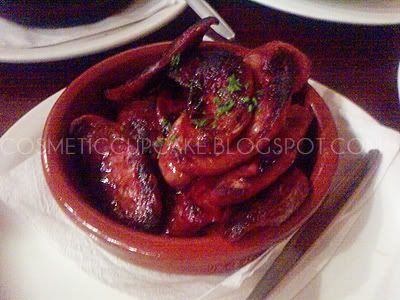 Chorizo a la Plancha - Grilled Spanish sausage. The chorizo was too salty for my liking tonight, we didn't even finish half of it. 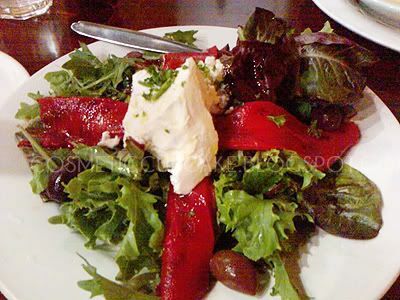 Ensalada con Queso - Lettuce, roasted red capsicum, goat’s cheese, olives. Very yummy salad to accompany our meal. By this time we were absolutely stuffed but needed a sugar fix so we headed over to Capitol Square for dessert at passionflower. No pictures of our dessert "The masterpiece" as it was far too dark. 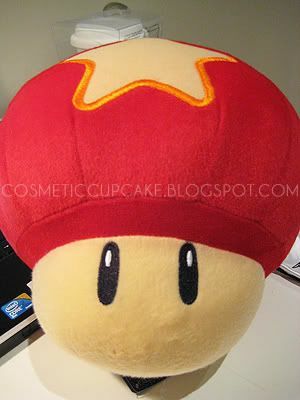 But cupid must have been smiling down because my bf won me a Mario Galaxy mushroom plushie to add to my collection!!! To top it all off I was given a beautiful Thomas Sabo bracelet for my currently homeless charms as a gift(EVEN THOUGH WE HAD SAID NO GIFTS). Thomas Sabo sterling silver bracelet. I'm spoiled! Hope everyone has a wonderful Valentine's Day no matter if you're in a relationship or not. '*:.b|u3. :*': Yeah he is sweet, when he wants to be! =p Ahhhh you should get a mushroom plushie anyway!